Can Your Child Play Sports with Asthma and Allergies? If your child has asthma and allergies, you may wonder if it’s a good idea for them to play sports. The answer to that is yes! Being active and playing sports not only helps kids with asthma stay fit, keep a healthy weight, and have fun, it also strengthens breathing muscles and lungs. If you question whether sports and asthma can get along, the American Academy of Allergy, Asthma, and Immunology reports that asthma affects more than 20% of elite athletes and 1 in every 6 Olympic athletes. It’s a good idea to know the allergy conditions in your area. Stay updated on your local pollen count this season through resources such as pollen.com. If the counts are very high, keep your child indoors, if possible. Be aware that pollen counts are usually worse in the mornings between 5-10 am and remember that windy and rainy days can stir up allergens. Depending on your child’s triggers, he or she may need to skip outdoor workouts when pollen or mold counts are high, breathe through the nose instead of the mouse while exercising, and make sure they properly warm up and cool down. It&apos;s important for kids to take their allergy medication. Skipping controller medication can cause symptoms to flare up, especially during exertion. Be sure your child always carries rescue medication. Be sure the coach knows about your child&apos;s asthma and allergies and what your child should do if they have an attack. Perhaps, have your child keep a copy of the instructions in their bag, or even give one to the coach if your child is small. It’s important that your child and the coach know when it&apos;s time for your child to take a break from a practice or game so that flare-ups are managed. 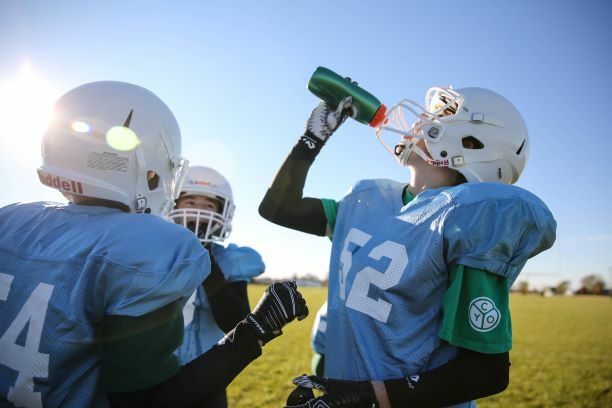 Since it’s probably not possible for you to attend every practice or maybe even every game, your child needs to know what triggers their asthma and allergies and what they should do to treat them. Learning to care for themselves is the best way to stop serious flare-ups. After your child plays outside, be sure they take showers and change clothes so the outdoor pollen doesn’t invade the house. It’s also a good idea for your child to wash his or her hands and face throughout the day. Use common sense when choosing a sport for your child. Some sports will be less problematic than others. For instance, swimming, biking, and walking most likely will trigger asthma and allergy problems. Sports that require short bursts of activity like baseball, football, and track may cause problems. There are many athletes in those sports who have asthma and allergies. My husband suffers from allergies and asthma, and as a small child was very sickly. But he grew strong enough to play football in high school and baseball and soccer in college. You will most likely find that with proper training and medication, and of course a doctor’s direction, your child can participate in any sport they choose.